Clear Coat Preservation: Are You Polishing Too Often? Many of us consider paint correction and polishing to be a necessary step in the exterior detailing process for most vehicles. This process helps to remove swirls, scratches, oxidation, and other defects from the paint in order to produce a flat and glossy finish with reflections that are deep and clear. Once a vehicle has been properly corrected, the depth and gloss is incredible, and will last a long time when properly maintained. While paint correction is certainly an important process to learn, it is perhaps even more important to learn how to maintain the vehicle afterwards in order to reduce the amount of polishing that is needed throughout the life of the vehicle. The paint correction process utilizes buffing pads of various aggressiveness combined with polishing liquids that contain abrasives in them. These abrasives work to remove a layer of paint to level defects. This is a concept that many people fail to pay attention to. Whenever an abrasive is used on your paint, you are actually removing some of the paint, and since your clear coat is quite thin, you do not want to remove any more than you have to in order to preserve your clear coat. 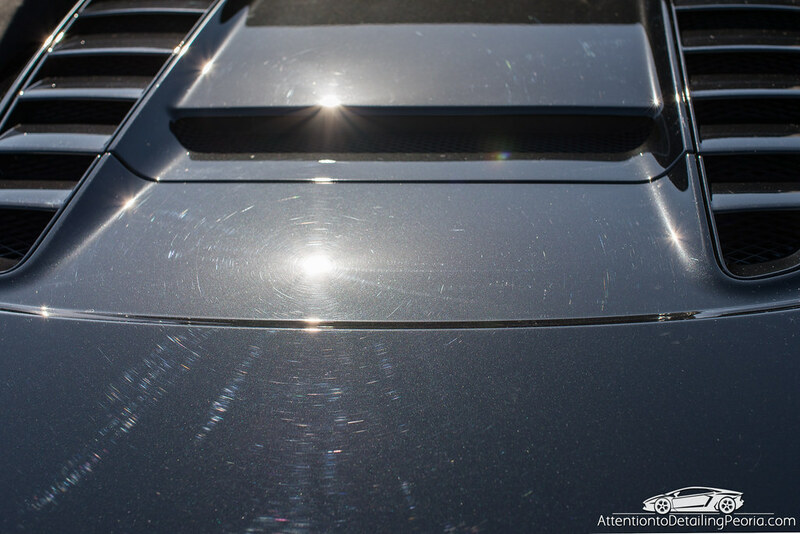 You often hear the expression “use the least aggressive method” with regards to paint correction. The idea behind this golden rule is that you only want to remove as little paint as possible to produce the results you are after and nothing more. The same ideology of being as non-invasive as possible can be applied to routine maintenance practices as well. Take the time to learn how to properly wash, dry, and protect your paint so that your vehicle does not need to be polished frequently due to swirls and marring caused by poor maintenance. Utilizing the 3 bucket wash method, or other careful washing practices, will help to ensure your vehicle has fewer swirl marks and defects over a given period of time compared to a vehicle that is not cared for properly. This means you will need to polish less frequently and you will not need to be aggressive with the polishing process, both of which help to preserve your clear coat over the life of the car. In general, I consider a light polish on an annual basis okay for routine maintenance – especially for jet black or other colors that show defects easily. I personally try to go 2-3 years in between polishing because I apply paint coatings like 22ple or CQuartz to our vehicles, therefore they are protected for several years and I do not want to risk compromising the coating by using an abrasive on them. If you find yourself needing to correct your paint more frequently, it may be beneficial to take a step back and analyze your entire maintenance routine. Chances are you will find that you can take some preventative steps to ensure your paint is not being damaged so frequently. Perhaps you simply need to purchase a new wash mitt or drying towels because yours are old and worn. Maybe you need to rinse your wash mitt out more frequently while washing. If you’ve got very sensitive paint, you may wish to invest in a forced air dryer like the Master Blaster or CR Spotless Water System to avoid touching your car while drying. Understand that adding some additional time or product cost to your maintenance routine will certainly be cheaper and less time consuming that continuing to correct your paint on a regular basis or in extreme cases paying for repainted panels. If you know someone who polishes their vehicle many times each year, take the time to teach them about the potential harm and expense that may result overtime from doing so. Many people who get into this habit truly do not need to use any abrasive on their paint, yet they do not fully understand what a polish is doing (removing material) and that they should most likely be using a sealant or wax instead for added shine and protection instead of a polish. 20 comments on Clear Coat Preservation: Are You Polishing Too Often? You have to be a Moronic Oaf to harm clearcoat paint by polishing. (1) Your not using an abrasive compound. (2) By using a wax/ sealant and a blue foam pad your nourishing the clearcoat paint as well as protecting it AND gradually removing white surface scratches through regular upkeep. Pop Quiz: Know why the dealers ‘Clearcoat Paint Sealant’ is guaranteed to last 5 years ? Because they hand you an ‘upkeep-kit’! You pay hundreds of dollars for the privilege of waxing your own car twice a year…Scandalous ! Would Menzerna SI1500 be considered a mild polish or could I use SF4000. I normally use M205 but I detail a lot of customers cars annually. I always apply Black Diamond paint sealant after polishing. SI1500 is fairly aggressive, relatively speaking. Menzerna rates it as a 7 out of 10 in terms of cut, and a 4 out of 10 in terms of gloss. SF4000 is rated at a 4/10 cut, and 10/10 gloss…. this is more of a traditional lighter polish that would be great for routine maintenance on most vehicles. SF4000 is similar to M205 in terms of cut, in my opinion. Great article, Zack! Especially the part about examining maintenance and educating clients. An ounce of prevention is still better than a liter of polishing compound. Thanks JC! That was the real goal of this article… to highlight the fact that although swirls and defects can be fixed… it is much easier just to avoid them in the first place! Putting as little abrasive as possible on the paint is my goal. I figure if I am careful, I can go at least five years without even a light polish. (Starting with a new car). As a matter of curiosity, Zach, how many light polishes can the average home detailer apply before failure? Five, ten? More? Yes, I know, it all depends on the manner of application. Don’t hold back on us. Tell us the truth. I saw elsewhere on the ‘net that even claybaring is “abrasive”. Of course, any solid-to-solid contact Is theoretically abrasive, but is this true in any meaningful way? For example, if you properly claybarred a car ten times could you tell with a thickness meter? Hey Jim – Assuming someone only uses finishing polishes, the amount of material that is removed is very, very small. If the clear coat is a healthy thickness to begin with, I would say someone could polish their vehicle annually for the life of the vehicle without any issues in many cases. A clay bar is not abrasive in my opinion. It is the particles that you are picking up that can be abrasive. As you rub the clay back and forth, you will lift bonded contaminates and embed them in the clay. These particles can then scratch/mar the surface which is why it is important to kneed the clay often to ensure you’re only using a clean surface of clay. Claying will not remove material uniformly like a polish will. So on my VW the paint seems to be very hard. I do not have anything more aggressive to work with (yet). But even if I use compound several times and see minimal changes to the defects, I obviously have not removed enough paint to worry about, correct? I am using M105, which I know is quite strong, but I only have light cutting pads which I think is holding me back in terms of cut. Correct – it is all relative. A cutting compound will have a different effect on soft paint vs. hard paint. The idea of this article was to simply reiterate the idea of “always use the least aggressive method” when removing defects, and even more so to highlight the fact that it is just easier to try to prevent swirls than to polish them out many times each year. The vast majority of people here are doing the right thing, however I do occasionally get emails where people state that they are polishing or correcting their paint 3, 4, 5 times a year! That is certainly a red flag that something is not right with their maintenance plan, or they are not understanding what the purpose of a compound & polish is. Hope that helps, Thanks for reading! I am not a car enthusiast or professional, but I’ve just purchased a new jet black BMW X5 and I want to maintain it in a pristine condition. What should I do? (I don’t want to be taken by a person willing to sell me something that I don’t need.). Thanks for your help. Hi Michelle, congrats on the new vehicle. I would highly recommend reading through our Detailing Guide, as well as browsing through articles on the Ask-A-Pro Blog. This will provide plenty of information on how to properly maintain your vehicle to the highest level. You can also do some research to find a reputable detailer in your area. Michelle, sites like this are a goldmine. I’m a”bang for the buck” (and time spent) kind of guy myself. I’d say getting any salt off the car is the first order of business if you live in that kind of climate. So go to the coin op and spray the undercarriage a lot with plain water during winter. Do it a few times now and then even if you don’t live in that kind of climate. Get the wheels good. I like the Garry Dean method of washing a lot. Google it. It’s hard to explain in writing. Quantity beats quality on the microfiber towels. Get them cheap at Sam’s or Walmart, but get a lot. Clay bar is a piece of cake on a new car, but it makes a big difference. (Hint: rinseless car wash mixed at 8x normal strength in a spray bottle ( put a gallon’s worth of product in a 16 oz. Spray bottle) is a cheap substitute for detail spray). Unless you live in Pittsburgh, you can probably get away with doing that once a year. The durable sealants these days are a revelation. I can recommend Collinite brand, Klasse brand. Over the counter Meguire’s Ultimate is almost as good. People in warm climates like the Duragloss brand. So-called “beauty waxes” that go on top of that are kind of a waste for people like us, but with a new BMW you want to do that once. Just don’t go nuts on the price. For people like us, spray waxes (on top of a newly washed car with sealant still on it) work fine. I like the Duragloss Aqua wax product, most people like the Optimum spray wax product even better. Can you recommend a link for a video or description of the 3 bucket wash method? Hi David, Here is a link to an article that walks you through the 3 bucket wash method. What do you think about CG’s Blacklight? Is it as aggressive as other polished? I just did a detail on my mustang: wash, blacklight, wash, then Wax(2 coats). I was thinking of doing a claybar, Blacklight, and then wax again in the fall. Is that too much Blacklight? Car stays garaged all the time so its not really dirty, but the wax doesn’t last that long either way. Hey Brian – Blacklight contains very fine abrasives for very light cleaning/polishing of the paint. If you’re using Black Light with a fine pad (like a Blue Lake Country Pad), then I would bet there is no real correction/polishing going on as the soft pad and the very light abrasives just won’t have any effect on the paint. You can add a bit more cut by using black light with a polishing pad or light cutting pad, but in any case, it is a very light cutting product. CG describes it as a “gloss enhancer & sealant”, and not as a polish. I would not hesitate to use this product several times each year as needed!